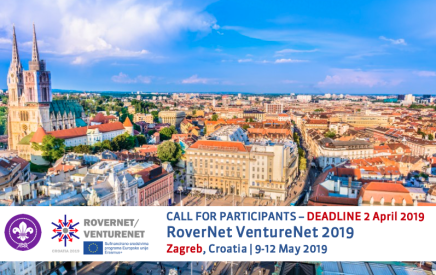 The European Scout Region of the World Organization of the Scout Movement (WOSM) is happy to launch this Call for Participants for the 7th edition of RoverNet and the 4th edition of VentureNet Network Meetings, which will be held in Zagreb, Croatia, from 9-12 May 2019. This event is a great opportunity for all National Commissioners in charges of Venture and Rover age sections (or members of their respective national teams) to meet and exchange knowledge, experiences, add contacts and build bridges for future international collaborations. Make sure to register before 2 April 2019. The Networking Meeting of commissioners involved in the management of adult resources is one of the well-known and successful networking opportunities for national leaders in the European Scout Region of the World Organization of the Scout Movement (WOSM). The event is now known under the acronym MOVIS (Management of Volunteers in Scouting) reflecting the wider area of interest of the network which goes beyond training. 2019 will see the eighth edition of this event in Tallinn (EE), from 23-26 May 2019, addressing issues of common interest for National Commissioners and other people who are directly involved at the national level in supporting the personal development of adults in Scouting. Make sure to register before 30 April 2019. 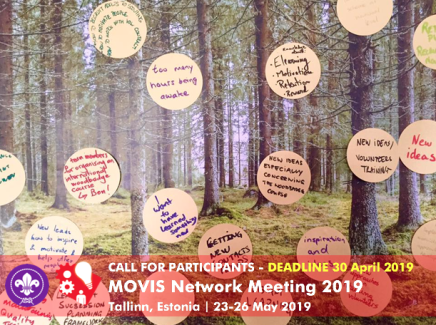 => Find our more about the MOVIS Network Meeting check Regional Circular 13 2019, information available on the event’s website and register online. 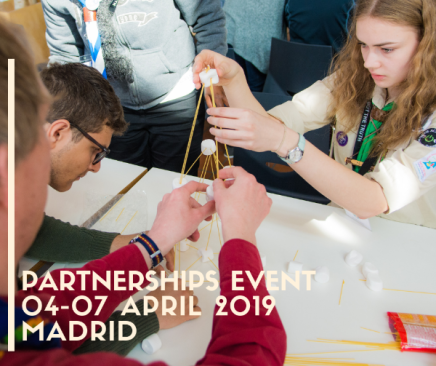 ASDE Scouts de España in collaboration with the European Scout Region of the World Organization of the Scout Movemnet (WOSM) on behalf of The Partnerships Network and in cooperation with the previous and next hosting organisations, are pleased to invite you and your partner organisations to the Partnership Event 2019, which will be held from 4 to 7 April 2019 in Madrid, Spain. This event is organised by The Partnerships Network, a coalition of Scout and Guide associations, which aims at fostering, strengthening and developing partnerships between associations in Europe and associations from other regions of the world. The overall idea of the network is to share and create information about ongoing partnerships, as well as to provide a platform for the exchange of experiences and knowledge. A continuing reflection on the relevance of partnerships, as well as the promotion of intercultural understanding and mutual respect are central elements of the Partnership Network. => Find out more about this event in Regional Circular 10 2019 and by following the event’s Facebook page. 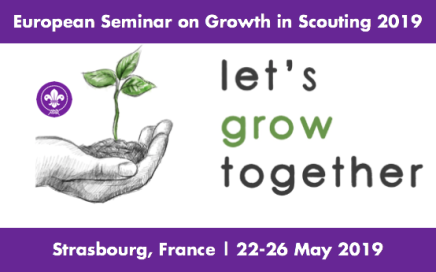 The European Scout Region of the World Organization of the Scout Movement (WOSM) is pleased to invited represetnatives of Member Organisations in Europe to the second European Seminar on Growth in Scouting which is scheduled to take place in Strasbourg, France, from 22 to 26 May 2019. At this event, Member Organisations from all over Europe can meet, learn about the various aspects of Growth and share experiences, as well as ideas and knowledge regarding the growth in their associations. Make sure to register before 20 April 2019. => Find out more about this event in Regional Circular 08 2019 and by following the event’s Facebook page. 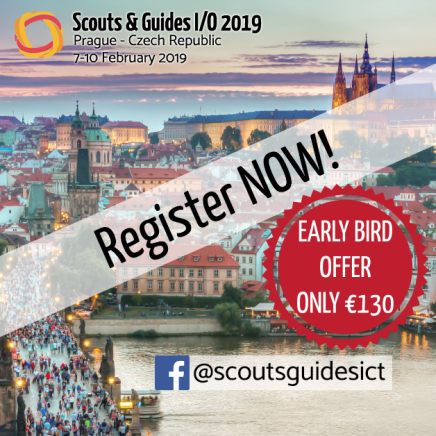 The ICT Network for Scouts & Guides of the European Regions of WAGGGS and WOSM presents its Scouts & Guides I/O 2019 Event, which will take place in Prague, Czechia, from 7 to 10 February 2019. In the digital world, the way Scouts and Guides engage in programme, training and Scout and Guide activities is changing and this brings challenges when strategies are devised and methods developed and created in our organisations. The overall goal of the ICT Network fro Scouts and Guides is to help Scouts and Guides whenever they think about applying or using technology in their Member Organisation. By doing this, the ICT Network wants to set the digital guideposts for Member Organisations. At the Scouts & Guides I/O Event Scouts and Guides gather to get inspired, grow connections with people and take a step forward on the path towards a digital Scouting and Guiding world.